When a strange boy tumbles down a river embankment and lands at her feet, seventeen-year-old adrenaline junkie Deznee Cross snatches the opportunity to piss off her father by bringing the mysterious hottie with ice blue eyes home. Except there’s something off with Kale. He wears her shoes in the shower, is overly fascinated with things like DVDs and vases, and acts like she’ll turn to dust if he touches her. It’s not until Dez’s father shows up, wielding a gun and knowing more about Kale than he should, that Dez realizes there’s more to this boy—and her father’s “law firm”—than she realized. Kale has been a prisoner of Denazen Corporation—an organization devoted to collecting “special” kids known as Sixes and using them as weapons—his entire life. And, oh yeah, his touch? It kills. The two team up with a group of rogue Sixes hellbent on taking down Denazen before they’re caught and her father discovers the biggest secret of all. A secret Dez has spent her life keeping safe. A secret Kale will kill to protect. Action, Intrigue, Excitement, and Romance killer combination. Jus gives you all this in one book what else can you ask for. WOW this book captivated me from the very beginning a non stop page turner. Dez is well sorta the heroine in this book you will either love or hate her. I just happen to love her. She is a tough as nails teenager who will stop at nothing to piss her father off. The perfect chance to do so just falls right into her hands when walking home from a party she runs into a guy Kale (um yummy) he is running from a group of men and she helps him out by taking him home to piss her father off little did she know but her father already knew him. Kale is what u call a Six he has a special ability a killer one at that the Touch of his skin kills any living organism except for Dez. Dez and Kale are in hideout to avoid Dez’s father Marshall Cross who she thought was an attorney when come to find out he is in charge of Denazen Corp. a place where he keeps Sixes and uses them as weapons. Dez will stop at nothing to stop her father from hurting any more people, and she even finds love along the way. I was lucky enough to read this awesome book and do an interview with Jus. Now how awesome is that? I got to ask Jus a few questions and even a Q&A with Dez (she rocks). I will leave links to find Jus at the bottom of my Interview I hope u all enjoy as much as I did. Let’s talk to Jus first to get this thing started. Q. Could you tell us a little bit about yourself? A. There's not a lot to tell about me. I'm fairly boring. I live in upstate NY with my husband and out three fuzzy kids--a snobbish GSD, a narcoleptic Akita, and a Brittney Lab mutt named Duck. I also have a guard bear named Oswald. He lives in the woods out back and frequently comes down to hang with us. I've been told that I speak my own, weird language and have an insane (and almost freaky) love of coffee and cheese. Q. What was your favorite chapter or part to write and why? A. Oh, this is a hard one... My editor will tell you I have a fondness for a specific (though short) bit involving a bear, but if I had to pick my absolute fave scene, it would be a certain kissy scene inspired by Black Lab's This Night. I won't say too much, but it's all kinds of swoon worthy. Q. Do you see yourself in any of your characters if so who and why? A. Dez and I share some traits--mainly because we're both snarky and have authority issues, but I think there's a tiny bit of me in all of them. Quirks, personality traits, fears... Writing is such a personal thing. You can't help pouring a little of yourself into the characters. Q. Have you always wanted to be an author if so do you have any authors that influenced you? A. I've always wanted to be either a writer or a chef. Well, there was one week when I was six that I wanted to be a Jockey... But I've always had this crazy, insane imagination and my grandfather was a chef so I grew up in the kitchen. I loved both things so much--food and fiction--but food seemed like the more practical of the two. I applied and was accepted to the Culinary Institute of America around the time I was reading Rob Thurman's Nightlife. I was all set to start at the CIA and I remember having this moment...this HOLY CRAP YOU'RE DOING THE WRONG THING kinda moment. I finished that book and was like, this is what I wanna do. I wanna create something this awesome. Q. Do you have a particular time or place that makes writing easier? Ok Thanks Jus for doing that little interview with us. I believe we will move on to Dez now. Hope your ready Dez because we are all ready to talk to you. Q. What was or is your best adrenaline rush other than the rush u get from being around Kale? ever tried it? We could totally take you with next time we go! To answer your question no I have ever bungeed but I would totally love too. 2. If there was one action or thing you did in Touch you could take back what would it be and why? take it back--but what's done is done. Q. What is the one trait that you deplore in yourself and in your father? me who I am, but it also gets me into a ton of trouble... As for my dad. met, and the one trait I despise above all is lying. Q. How far would you go to piss your father off? A. All the way. I'm constantly striving cause him high levels of stress. .Q. In true twitter fashion 140 characters or less how would you describe Kale (Yummy) ? Thanks for talking with us Dez would love to have you come back when Toxic comes out. I'll pop in and out throughout the day in case anyone has any questions or wants to chat! Love this character interview. 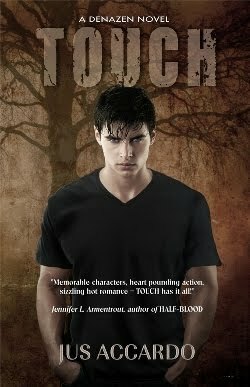 I've heard so many wonderful things about Touch and I'm really looking forward to reading it! How interesting that you wanted to be a chef! See, your creative energy was seeking an outlet! Congrats on the release of TOUCH! HI Jus, great interview and I can't wait to read this book. Great Interview!! I loved both of them. I just received this book and am going to start it soon. I heard a lot of awesome things about it.